Finding janitorial workers compensation insurance coverage for Janitors, Maids and other Cleaning Services Employees is now simpler than ever before. Simple Work Comp is a nationwide broker providing quality workers compensation for janitorial service companies and contractors. 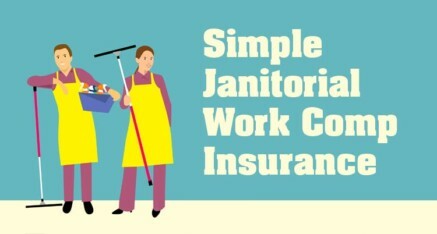 Offering the most affordable Janitorial workers’ comp insurance available in your state. We work hard to Keep it Simple for you! We know that janitorial companies have had challenges with their Janitorial Workers Compensation Insurance over the years. Janitorial Work Comp rates are higher than before, and big surprises always seem to pop-up around audit time. Simple Work Comp has taken away some of the pain in dealing with workers compensation for Janitorial companies who employ Janitors, Maids and Other Cleaning Services employees by creating programs for janitors with less than ten employees and for janitorial companies with more than one hundred employees. General Liability Insurance is a fundamental part of general contractors workers compensation insurance. General Liability Insurance (GL) provides protection against lawsuits and other financial liabilities that can result from accidents. GL is often bundled with a other coverages in a Business Owners Insurance Policy (BOP). As a general contractor you might not need all these coverages. You could be eligible to get contractors workers compensation insurance with general liability protection without a BOP if available in your area. Protect yourself and your business with contractors insurance through the Simple Work Comp General Contractors Worker’s Compensation Program. Our contractors insurance could provide you with a Business Owner’s Policy (BOP) with General Liability Insurance, Workers’ Compensation Insurance, and commercial vehicle insurance – all in one place! This helps to reduce the hassle of dealing with multiple companies and contacts to purchase and maintain your contractors insurance.